CRM Java Scripts: How to filter view on dashboard with html web resource. How to filter view on dashboard with html web resource. CRM-2011 How to filter view on dashboard ? CRM-2011 How to filter view without date time attribute ? CRM-2011 How to filter view with HTML web resource ? CRM-2011 How to update fetch of a view ? 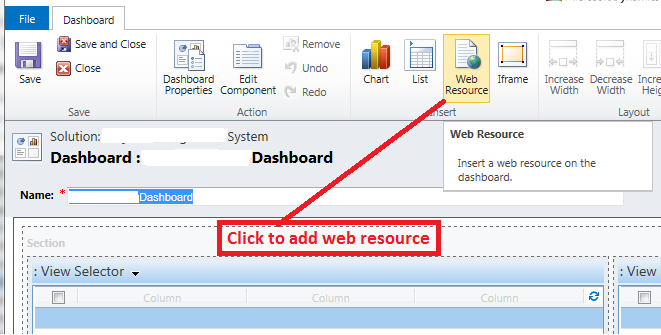 CRM-2011 How to filter view on dashboard with HTML web resource ? Here you can get the answer of above questions regarding CRM 2011. If you want to filter a view on the dashboard with date time and you do not have date time attribute and option set of for month and year in your entity then don’t worry you are on right place. I will provide you code and steps by which you can filter view with date time without having date time field in entity related to view. Step 1: First of all add a HTML web resource in your crm solution. And write the fallowing code in the web resource. Step 2: Create or Open dashboard to add web resource on dashboard. web resource button you added in step 1. Labels: How to filter view on dashboard with html web resource.